Gamification – the corporate buzzword of the 2000s gets a new meaning thanks to augmented reality. Before augmented reality, gamification was a vague concept: all the companies were trying to do it, but nobody was sure if they got it right. As a theoretical concept, gamification is great: it means making boring activities, such as shopping for groceries, seem fun by adding a certain note of playfulness to them. Top brands could bet on celebrity endorsements, and proprietary cartoon characters animated in PC and mobile games. But the level of engagement and interaction was still at the level of mild enthusiasm. Customers did not feel like true participants in the game and the emotional rewards were limited. However, augmented reality changed all that. For the first time, customers felt in full control of the interaction. As active participants, they could reinvent the real-life environment, try various combinations before making a choice, and unlock hidden rewards. We will all remember the summer of 2016 – when everyone walked around looking at their mobile phone screen and trying to capture Pokémon GO characters. Many retailers saw this über-popular game as a huge opportunity to attract customers to their store, by becoming sponsored locations and offering discounts to the players of this engaging augmented reality game. Over 35,000 stores have joined the game by 2017, attracting around 500 million visits during this one-year period. One of the participants took things even further: Starbucks launched a special beverage, The Pokémon GO Frappuccino. The game of trying on clothes was never really fun in large stores. There was always a large queue of people waiting and grumbling. Customers felt self-conscious and the lighting of the changing booths was never flattering. Augmented reality mirrors, like the one installed in Macy’s store, have made the process of shopping for clothes really fun, for the first time ever. Customers are encouraged to try as many combinations of outfits as they want, and test the same product in various colors. What’s more, the mirror assesses their size correctly and recommends only items in stock in the right size. After the first augmented reality shopping apps were launched, brands learned a valuable lesson: the more items they add to the app, the more their customers are willing to buy. There is nothing more engaging than the game of testing various products free from the commitment of buying them. And the customer doesn’t even have to leave their house. On the contrary, they can virtually arrange holographic items, interact with them and make an informed choice. As the variety of products they can buy grows, so does the emotional gratification – and the number of items checked out through the online payment gateway. There is no doubt that brand stories are the strongest marketing tool for creating customer loyalty. Years ago, brands used to write their stories. Then, they started making videos. With augmented reality available to them, top brands, such as MTV and AMC Theaters, have started getting their customers involved in the brand story, and inviting them to interact through AR apps and understand the mission statement and the values the brand stands for. 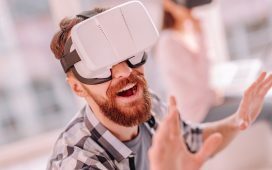 Undoubtedly, marketing specialists and retail brands will continue to develop new avenues in which augmented reality and gamification work together to create exciting experiences for customers, reinforce the brand image and drive more sales. After all, this cutting edge technology is all about creating new possibilities and pushing the limits of reality.